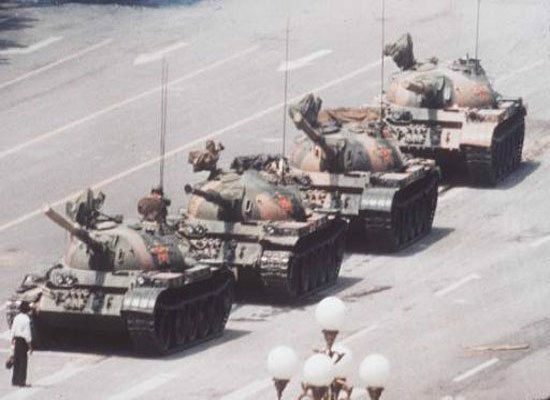 This iconic image from Tiananmen Square of a lone man holding up a line of tanks has come to symbolize the common person's stand against authority. Some call it the “Tiananmen Square Massacre,” others say the “Tiananmen Square Crackdown,” and in China it is known merely as an “incident,” the “June 4th Incident,” or as the Chinese say, “liù-sì shìjiàn“. This year marks the 20th anniversary of the event. Hong Kong, which has been under Chinese rule for the last 12 years under the "one country, two systems" program, is the site of huge protests each year to mark the event. 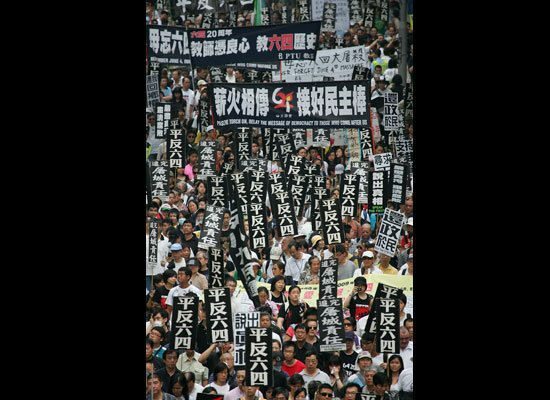 On May 31, thousands of protesters thronged the streets in Hong Kong to ask Chinese officials to address the Tiananmen massacre and to change their official position of the event. No matter how you refer to the 1989 democracy protests in Beijing and the brutal response by China’s military, on Thursday, June 4th, the world marks the event’s 20th anniversary. For a time line of the events leading up to the events that shocked the world, check out this slideshow. While June 4th passed in Beijing quietly, it was a different story in Hong Kong, the China-ruled independent territory not subject to the mainland’s controls of information and news. TIME reports that 100,000 people in Hong Kong showed up for a massive candle-lit vigil Thursday evening in the city. i was checking out our web stats this morning and noticed that we’re getting a lot of visitors from China today. welcome to all of you! peace! Our hearts go out to the great Chinese people, who someday will learn of their history from June 4, 1989, and overthrow their authoritarian government. The Chinese rulers are NOT “communists” – as anyone, anyone, who has ever read the Communist Manifesto knows. They are in name only. And by the way, Americans, don’t get too glorified, as we have our own Tiananmen Square – it’s called Kent State massacre, the Jackson State massacre and the gunning down of Black Panthers and others who sought change in this country during the late sixties and early seventies. No one has ever been held accountable for these murders, either. Molly, I agree with you. How can anyone have a dry eye when they watch the video of the solitary figure holding up that column of tanks. Pure,unbridled bravery in the face of death. I wish our fellow citizens had that kind of bravery, my dear. molly – maybe with the new perspective that our government seems to be taking in regards to humanity, some right wingers or some govt agency will be held accountable. its doubtful that the people who pulled the trigger will actually go to jail, but maybe there will be some kind of memorial service and official apology for the crude violation of civil rights during those times. it would be nice to know that our elected officials recognize our ugly past, no? All Chinese visitors are welcome, unless you are from the government.